A study published in BMJ reports that fewer than half of clinical trials funded by NIH grants resulted in publications within 30 months of completion. 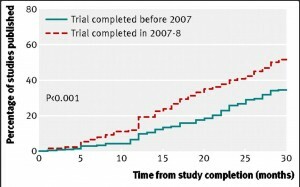 Researchers at Yale reviewed 635 clinical trials conducted between 2005 and 2008 and found that only 46% appeared in peer-reviewed, MEDLINE-indexed journals by 2011. Even when the authors extended their search to 51 months after the completion of trials, one-third remained unpublished. They can only speculate on why investigators might not publish their findings. Certainly, some might appear in abstracts or posters that do not appear in electronic indexes. There’s some comfort in knowing that studies completed later in the sample period were more likely to appear in print. Because public funds supported the trials, it is important that their results, even if negative, be disseminated widely. In an earlier post, I mentioned the growth of online peer review. One of those sites, Faculty of 1000, provides post-publication peer review. Content experts evaluate published papers and score them based on how importance. 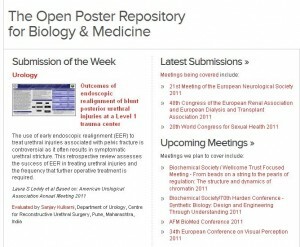 The site has now expanded to include reviews of posters at academic conferences. You have to register to read the evaluations, but any user can scan the submissions. And it’s another avenue for faculty to demonstrate the reach of their research. Traditional peer review seems fairly entrenched for journal submissions, but when it comes to posters and conference papers, the web provides a universal platform for disseminating ideas. In 2007, two economists were interested in how much an R01 grant from the NIH influences subsequent publication. Presumably, researchers who receive funding would generate more data and produce more academic papers. Quantifying the impact of government funds provides an important argument for continued public investment in science. The authors analyzed all applications for R01 support (both successful and unsuccessful) between 1980 and 2000. The sample included over 18,000 individual researchers. Surprisingly, the data showed that scientists who received NIH grants produced one additional paper over the subsequent five years compared to those who did not receive the grant. Nor do the citation rates of grantees differ significantly from their unfunded counterparts. The findings do not necessarily devalue the importance of NIH-funded research. Biomedical benefits go beyond the publishing of papers. The authors hypothesize that researchers who fail to receive NIH funds usually locate other sources of support or shift their area of interest to a more fundable topic. Resilience is key. Conducting a literature review these days rarely involves going to a library. With all major journals indexed online and much of their content available digitally, if I come across a citation I can’t access from my office, I question whether I really need to read it. A study published in FASEB called Open access, readership, citations: a randomized controlled trial of scientific journal publishing attempts to answer if articles made freely available online get cited more often than others. After examining 36 journals, 712 open access articles, and 2533 subscription-controlled articles, the author found no citation bump for open access articles. What did increase was the number of downloads. This suggests that research published openly online reaches a wider audience. The scholars who contribute to academic literature still benefit from subscription access to journals, so they can choose to cite articles based on relevance and quality. But if researchers would like to measure the impact of their work, they should look to more than just citations. Advocates of open access scholarship have been persuasive in their call for making materials freely available online. Harvard faculty now can deposit all their publications in a web-based repository, bypassing journal restrictions. One advantage of such databases, the theory went, was that online articles are more likely to be read and cited than those behind a subscription wall. Now, a report from two economics researchers casts doubt on that assumption. They surveyed 260,000 articles published in 100 economics and business journals from 1956 to 2005 and found no evidence of a citation boost for articles appearing in open access journals. The one significant advantage came from articles available in JSTOR, an online, subscription-based service. Commentators told InsideHigherEd.com that the study did not distinguish between free online journals and online articles behind pay walls. So, the debate is not settled. Even without the jump in citations, though, it seems good practice to make scholarship as widely available as possible. Particularly for faculty and trainees at underresourced institutions or in developing countries, having access to research is valuable. They may not cite the articles, but they will use the knowledge. NASA called a press conference in December to announce a major new discovery. Researchers had documented a new strain of bacteria that uses arsenic rather than phosphorus as one of its biological building blocks. The press speculated on what this find could mean for extraterrestrial life and interviewed the paper’s authors. At the same time, scientists were scrutinizing the paper on-line. According to an article in Nature, the place of peer review is migrating from the safe sanctums of journal editors’ meetings to the unregulated world of the Internet. Through blogging, Twitter, and on-line comments, the review of science continues even after a study is published. And the pace is much faster. The change heralds some potential positives for scientists. A website called Faculty of 1000 organizes post-publication peer review along a kind of Amazon rating system for articles. These scores may help faculty demonstrate excellence when going up for promotion. The next step seems to be a more open process of pre-publication peer review. Editors and authors, however, will resist that change in hopes of preserving at least one place where review is rigorous and controlled. In 2006, Lynne Truss wrote a book about grammar called Eats, Shoots and Leaves. The title refers to the joke about a panda who dines at a restaurant, points a gun at the server, and then takes off. When the astonished owner looks up”panda” in the dictionary, the strange behavior becomes clear: “an animal that eats, shoots, and leaves.” The addition of those two commas changes the meaning entirely. Truss’s point is that we should be scrupulous about grammar. I admit I find a silent thrill in spotting a sign at the produce section marked “blueberry’s $2.99.” It makes me feel superior in my knowledge of punctuation. But when it comes to the check out line, I’m not sure I could say with certainty whether it should be “10 items or less” or “10 items or fewer.” Suddenly, my feeling of superiority evaporates. Two education experts share their tips for editing in a post on InsideHigherEd.com. They make a useful distinction between mistakes (careless slipups) and errors (rules we don’t know). In editing, it helps to focus on the mistakes first. When it comes to errors, we will have to rely on other sources. As the panda example shows, correcting these glitches is not trivial. If it hinders clarity, then a grammatical mistake or error can confuse a reader, weakening our argument. Faculty aiming for promotion often hear the advice, “Make it count twice.” That is, if you develop a new curriculum, present it at a conference. If you make a conference presentation, turn it into a journal article. The idea is that once the effort has been expended, the reward should be maximized. But how original should each piece of scholarship be? A story in Nature describes A Canadian professor of engineering who recycled much of the same content without acknowledgment in 20 different papers. The matter has led to discussions over how universities and journals can police duplicate submissions. One biomedical researcher has developed software to detect similarities in published papers. Internet searches in general make self-plagiarism easier to detect. Perhaps as a result, the NIH has investigated zero instances of plagiarism in the last three years related to the 325,000 researchers it funds. On the MedEd Portal homepage, the first featured publication is a submission from our Department of Medicine colleagues, Dan Alford, Angela Jackson, and Jane Liebschutz (with Ben Siegel from Pediatrics). Their publication, Prescription Drug Abuse: An Introduction, started as a two-hour lecture for internal medicine residents. After receiving evaluations, they enhanced the presentation with PowerPoint slides and references. For submission to peer review, they included learning objectives and lessons learned. The Faculty Development Seminar series will include a presentation on how to publish educational scholarship using MedEd Portal. It is scheduled for Monday, December 13 at noon in Evans 118. The on-line database is also a helpful source for ready-made and tested teaching materials. I’m part of a medical education journal club. Before each meeting, the organizer circulates a PDF file of the assigned reading via e-mail. When we want to share an article with students, it’s common to post the PDF file on Blackboard so the class can access it. At my own website, I maintain a reading list of faculty development topics, many accompanied by PDF files of articles. The ubiquity of PDFs (a product of Adobe) has made scholarly life easier. I know I greedily hunt out PDF versions of articles to save to my hard drive when I’m doing a literature search. But a post on the blog Savage Minds questions the long term consequences of making PDFs the default academic format. For one thing, it’s a proprietary system. I can read PDFs for free, but if I want to annotate and manipulate the files, I need to buy the $300 Adobe Acrobat software. It’s also possible for publishers to place restrictions on files that make them more difficult to circulate. With the rise of e-books, there are several alternative models out there for reading files on a screen. The next time I attach a PDF to an e-mail, I’ll think before I send.